Our researchers have teamed up with Southampton Football Club to find ways of preventing injuries and protecting players from developing arthritis in later life. Busy training schedules and injuries place significant demands on elite athletes' bodies during their careers. Their health can also be affected in later life; it is well known that footballers are at high risk of developing arthritis as they get older. 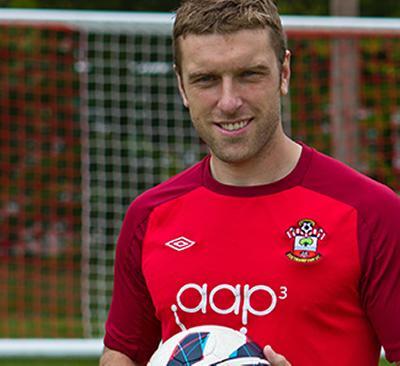 Working in partnership with Southampton FC, experts from the University are helping players from the academy to the first team, including England international Rickie Lambert, to stay healthy and injury-free, by designing targeted exercise programmes. The targeted exercise programmes aim to reduce the incidence of injuries in professional footballers’. This will involve developing ways of improving training and warm-ups to reduce injuries such as pulled muscles and tendons, and avoid overloading their joints during matches and in training. The researchers hope their research will enhance current FIFA (F-Marc: Football for health) and 11-plus guidelines on warming-up. The team, which also includes Dr Martin Warner, Senior Research Fellow, and Nadine Botha, Research Physiotherapist, is investigating the effects of FAI in young footballers from the age of nine, in an effort to prevent the condition developing. They are taking players into the biomechanics laboratory at the University and making precise measurements of their movements during various activities, such as kicking a ball, using 3-D technology. Mo Gimpel, Sports Medicine and Science Manager at Southampton FC, said: “We have found that players' hip and groin pains, including FAI symptoms, can be resolved through exercise specifically developed for the individual. This is especially effective in three areas, symptomatic FAI; chronic groin pain and as a preventative measure to stop symptoms in the hip and groin area in the first place. The work is being done as part of the new Arthritis Research UK Centre for Sport, Exercise and Osteoarthritis, which aims to develop better injury prevention and treatment methods, and create screening tools which can predict an individual’s risk of developing osteoarthritis as a result of sports injury. The centre is made up of seven universities: jointly led by Nottingham and Oxford, with Southampton, Bath, Loughborough, Leeds and University College London.